PARSIPPANY, N.J., Dec. 13, 2018 /PRNewswire/ -- Global Aerospace, Inc., a leading provider of aerospace insurance, is pleased to announce two enhancements to its exclusive Aircraft Breakdown Assistance program. The program, launched in January 2018 to its U.S. light aircraft policyholders, will now also be available to Global Aerospace policyholders with kit, experimental, antique, rare and unique aircraft. In addition, upon renewing their policy in 2019, qualified Global clients who signed up for the Savvy program in 2018 will be automatically registered for another year of protection, at no additional cost. New policyholders in 2019 will also be eligible to sign up for the Aircraft Breakdown Assistance program at no additional cost. Marilena Sharpell, senior vice president and underwriting and operations executive at Global Aerospace comments, "We are pleased to be able to expand upon this valuable program to include our kit and experimental aircraft clients." Ms. Sharpell adds, "Providing automatic renewals seamlessly to clients that have already enrolled in the Aircraft Breakdown Assistance program, further demonstrates the importance we place on bringing this valuable protection to our clients." The Aircraft Breakdown Assistance program supported by Savvy Aviation is available at no additional cost and provides professional maintenance management, consulting and breakdown assistance for owner-flown general aviation airplanes. A mechanical problem with an aircraft while away from home can be an owner's worst nightmare. The Aircraft Breakdown Assistance program provides Global policyholders with 24/7 access to a dedicated toll-free assistance hotline and experienced Savvy Airframe and Powerplant and Inspection Authorization (A&P/IA) technicians. Savvy technicians will troubleshoot mechanical problems and help owners determine whether an aircraft is safe to fly home. If repairs are needed, they will help find a local, trustworthy maintenance provider and work with them to get pilots safely, and quickly, back in the air. As a specialist aviation insurance provider, Global Aerospace is continuously developing customized, exclusive solutions to deliver products and services to benefit our clients and their brokers. The Aircraft Breakdown Assistance program is available at no additional cost to Global Aerospace, Inc. policyholders if their policy begins or renews on or after January 1, 2018. 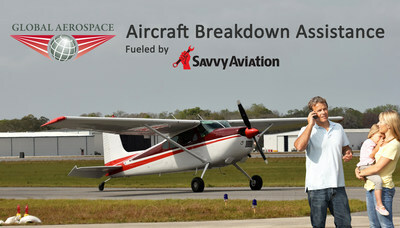 To activate your exclusive Aircraft Breakdown Assistance membership today, please visit savvyaviation.com/global. Global Aerospace is a leading provider of aerospace insurance with a worldwide portfolio of clients who are engaged in every aspect of the aviation and space industries. Headquartered in London, we have offices in Canada, Bonn, Paris, Zurich and throughout the United States. Across the world, we employ over 300 people. With experience dating back to the 1920s, the company's underwriting is backed by a pool of high quality insurance companies representing some of the most respected names in the business. For additional information about Global Aerospace, please visit www.global-aero.com. To learn more about the company's SM4 safety program, please visit sm4.global-aero.com. For more than a decade, Savvy Aviation's extraordinary team of veteran maintenance experts has been serving as a trusted maintenance advisor to more than 10,000 owners of general aviation aircraft. Savvy provides a broad palette of maintenance-related services that includes comprehensive maintenance management, maintenance consulting, a national prebuy program, analysis of engine monitor data, and 24/7 fast-response breakdown assistance. Savvy was founded in 2008 by Mike Busch, arguably the best-known A&P/IA in general aviation, honored by the FAA as 2008 National Aviation Maintenance Technician of the Year.